Symphony No. 9 in E-minor, Op. 95 "From the New World"
Was sich schon in der Uraufführung zeigte, findet in dieser sorgfältig produzierten Aufnahme ihre Bestätigung (...). Leon Fleisher (...) erweist sich (...) als kompetenter Solist dieses Kraftakts, unterstützt mit bestechender Präzision vom Orchester des Curtis-Instituts (...) dem man die permanente Zusammenarbeit mit dem Dirigenten des Philadelphia Orchestra in jeder musikalischen Phrasierung anhört. Keine Frage: Die 'Klaviermusik mit Orchester op. 29' wird sich ins Repertoire spielen. (...) Unter der Stabführung von Christoph Eschenbach lässt das rhythmisch vibrierende Zusammenspiel mit dem Solisten und dem Curtis Symphony Orchestra kaum Wünsche offen. The mighty Fleisher makes the exhumation bracing. Leon Fleisher (...) gives a dynamic performance of the solo part, and the Curtis Symphony Orchestra contributes energy and piquant colour. Dvorák's New World Symphony (is) exquisitely rendered here by the youthful prodigies of the Curtis. The outer movements (of the Klaviermusik) are examples of (Hindemith's) abrasive early modernism at its finest. The slow movement, meanwhile, is a wonderful mix of Bach and blues, in which the piano picks out a stark counterpoint to a succession of woodwind solos over a pizzicato walking bass. Leon Fleisher (...) is the hard-hitting soloist, and the Curtis Symphony Orchestra is energetically conducted by Christoph Eschenbach. 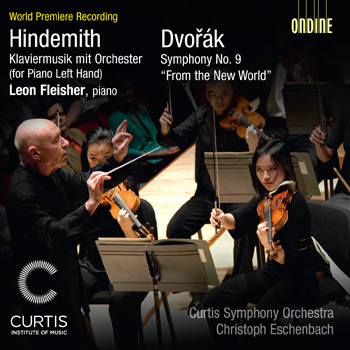 It's not too often anymore that we get a world premiere recording of a work by a composer as well-known and widely performed as Hindemith. (...) Fleisher's performance is exactly what one might expect: electrifying. His earlier mastery of the other works for piano left hand make him the perfect performer for this composition. (...) The students of the Curtis Symphony Orchestra do honor to Hindemith and Fleisher in their own careful attention to detail. Fleisher ist, wie diese Aufnahme zeigt, der ideale Interpret des Werkes. Bewundernswert, mit welcher Perfektion, Brillanz und Einfühlung der inzwischen 80-Jährige dieses Werk spielt (...). Fleisher macht deutlich, dass dieses Werk eine entscheidende Bereicherung des Repertoires für die linke Hand ist und den Konzerten von Ravel und Prokofieff in nichts nachsteht. Das Sinfonieorchester des Curtis Institute ist dem Pianisten unter Leitung von Christoph Eschenbach schon bei Hindemith ein aufmerksamer wie ebenbürtiger Partner. In der neunten Sinfonie von Dvorák läuft es zu großer Form auf. This CD contains the first-ever commercial recording of a long lost major work by Paul Hindemith, the Klaviermusik mit Orchester op. 29 for piano left-hand and orchestra. The New York Times has called it, “a fantastic work that requires tremendous technique and stamina.” (December 2, 2006). This release also features Antonín Dvořák’s popular Symphony No. 9 (“From the New World”). Hindemith wrote the concerto for the one-armed pianist Paul Wittgenstein in 1923. Wittgenstein never performed it, and it was only upon the death of his widow, in 2002, that the piece was discovered in a farmhouse in Pennsylvania; the work received an acclaimed 2004 world premiere in Berlin, with piano legend Leon Fleisher as soloist and the Berlin Philharmonic under Sir Simon Rattle. Leon Fleisher, who is one of the most prominent specialists of left-hand repertoire, is the soloist on this recording. Christoph Eschenbach, one of today’s leading conductors, here directs the Curtis Symphony Orchestra, an orchestra that the Philadelphia Inquirer acclaimed, “that any city would be lucky to have as its professional ensemble.” This CD is the Curtis Symphony Orchestra's debut album on Ondine. "We are delighted to have the opportunity to share the extraordinary artistry of Curtis students with a worldwide audience. Over the past few years, Christoph Eschenbach has led the Curtis Symphony Orchestra in many outstanding performances, and this project captures their unique relationship on record, " said Roberto Díaz, President of The Curtis Institute of Music. The Curtis Institute of Music trains exceptionally gifted young musicians for careers as performing artists on the highest professional level. One of the world's leading music schools, Curtis provides full-tuition scholarships to all of its 162 students, ensuring that admissions are based solely on artistic promise. A Curtis education is uniquely tailored to the individual student, with personalized attention from a celebrated faculty and unusually frequent performance opportunities. This distinctive "learn by doing" approach to musical training has produced an impressive number of notable artists, from such legends as Leonard Bernstein and Samuel Barber to current stars Juan Diego Flórez, Alan Gilbert, Hilary Hahn, Jennifer Higdon, and Lang Lang. The Curtis Institute of Music expresses its deep appreciation to the Neubauer Family Foundation, which has made possible and underwritten this recording of the Curtis Symphony Orchestra. The CD booklet includes liner notes by Hindemith scholar Giselher Schubert (director of the Hindemith Institute in Frankfurt, Germany) and by David Ludwig.